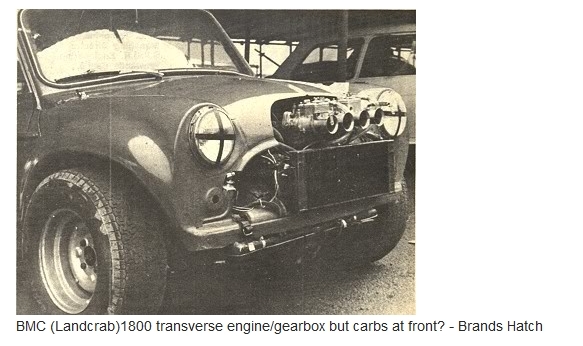 I have been doing a bit of research into fitting a Maxi 1500/1750 engine into a Mini but to be honest I can't find an awful lot of information on it. I know this was quite a popular conversion back in the day so i am sure there is plenty of information out there regarding it but it has yet to be documented. So far I have been able to find plenty of naysayers, probably for good reason, but at the moment I am not interested in the outcome but more how it was actually done. 1) Use an automatic subframe as this will get the engine lower in the body. 2) Some form of bonnet scoop/mould will be required. 3) Pot joints are the same as a Mini. 1) Driveshafts? Do the Mini shafts fit directly or do they need shortened/lengthened? 2) Engine Mounts. Can the Mini mounts be used with minor modifications or do the mounts need fabricated from scratch? 3) Gearchange. Can the Mini rod change be used? 4) Fuel and Wiring. I assume this is all pretty straightforward and will just require a bit of tweaking from the mini systems. I know this will likely provoke responses of boat anchor, don't bother fit a k-series etc, handling will be ruined etc but as I mentioned it is more how it was fitted that interests me. I did see that article but there is not an awful lot in it about how the conversion is actually done. About 40 years ago, I took a 1750 conversion in lieu of parts that I had supplied and fitted to a Mini Miglia. It had been crudely, but soundly done, and I easily got an indicated 125 MPH out of it on the M50, but it was no longer a Mini to drive. I sold it after a month to a guy in South Wales, to do Eppynt, but he pranged on the "Heads of the Valleys" road within a week. 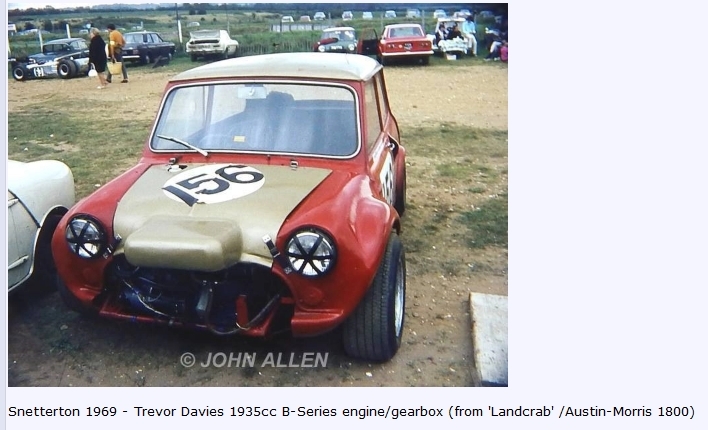 Another popular engine transplant conversion in the 1960's (when transverse fwd units were much less common) was from the Mini's big brother the Austin/Morris 1800 'Landcrab' also with a transverse gearbox in sump layout with the BMC B-Series engine. The main problem with most of these conversions was the extra weight which spoiled the Minis handling. Would be nice to see some done today using Maxi or Landcrab engine/gearboxes as interesting 'period' conversions! Edited by mab01uk, 07 February 2019 - 01:02 PM. A friend of mine did this conversion with his Moke back in the late 70's. It's still around and does get used from time to time today. 1) Robin's conversion used an older version of this that had a Cable Shift and Universal Joint set up, however, if the Pots are the same as a Mini, then Mini Dive Shafts should fit, however the diff in the gearbox is not quite in the same location as a Mini and the diff is wider, so while Mini Drive Shafts may fit the splining, they are too long for this set up. 2) Robin (IIRC) Used the standard 1500 Engine Mounts but extensively modified the subframe, including where the engine mounts located to. 3) Rod Shifter. While I've not seen a Rod Shift set up for these, I can't see why this would at all be an issue. It will likely involve shortening or lengthening the rods to suit, just be sure to align the holes in shift rod (the lower one) exactly / accurately. 4) That is the least of your issues and is straight forward. One issue you will hit and the only way around it is frightfully expensive and in the case of a 5 speed, not possible to get around, is the Final Drive Ratio. They are 3.9:1. They are unique to these cars and that was the only ratio ever made. You can get new gears made, which would suit a 4 speed version, but as the 5 speed type uses the Final Drive Pinion for 5th gear as well, changing this to anything smaller than a 16 tooth pinion will render 5th gear inoperative and a bigger one won't fit without removing the 5th gear. I guess, yet an even more expensive way around this is to also have a new 5th gear made. A Crown Wheel & Pinion to have made would set you back circa 3000 - 4000 GBP. Another headache is that many parts for the engine and gearbox in particular are long time NLA. Basic parts like Baulk Rings and selector forks, forget it. Robin's conversion I mentioned was based on the 1500 engine and a 5 speed cable shift gearbox. The Gearbox itself proved very strong and reliable, however the shifting mechanism was utter rubbish, It had a poor feel and was forever needing adjustment. It also lacked an Interlock (which came out later), so would often lock in 2 gears at the same time. The Rod Shift version I'm sure would have an interlock in it so, this shouldn't be an issue. The Engine, while reliable, was an extremely poor performer and very poor on fuel. He modified the engine several times in order to get acceptable performance from it, and eventually got it to a point where it would keep pace with a stock 1275, but was always heavy on fuel. Perhaps a 1750 would be better ? We just never got them nor the Rod Shift gearboxes out here. Robin preserved with his converted Moke for around 8 years (and he was nearly always 'at it') before giving up developing it any further and coming to the conclusion that a good 1275 is better, mainly in that it's lighter, with similar engine output and way less thirsty. This was also proven with back to back testing. I know that you've said your mind is made up on this, however, if you were keen for an engine swap in this way, I would strongly suggest one of the more recent Japanese engine / gearboxes. Edited by hunterg30, 07 February 2019 - 06:29 PM. I remember these conversions and almost all of them ended up in ditches Just remember to upgrade your braking system. also b series could be tuned a bit , also with crossflow heads IIRC? Edited by sledgehammer, 07 February 2019 - 07:43 PM. I think it was the auto 1800 that had the chain & sprocket?